People don’t talk about brands like they used to. 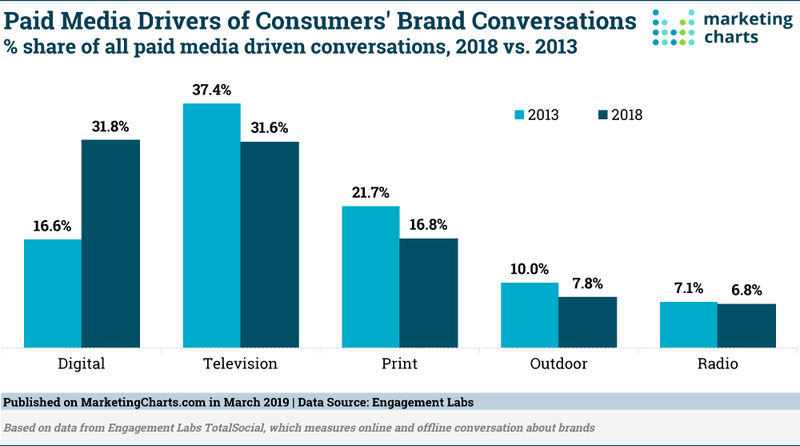 A new report from Engagement Labs shows that conversations, among young consumers especially, dropped from 115.2 conversations per week in 2013 to 94.6 in 2018. Perhaps, it’s because there’s just so much other cultural nuggets to talk about and share from new Netflix series to politics to content being shared online. There’s no shortage of stuff to talk about. It could also be because the traditional brand conversation driver—television—is declining in interest, particularly among younger audiences. Traditional media may still deliver reach and impressions, but it’s digital channels that now drive the most word-of-mouth. Marketers need to exist, thrive and create content in digital channels if they hope for their campaigns to have an exponential word-of-mouth effect—which they should. “Nearly three times as many people said content from friends and family influences their purchase decisions compared to content from celebrities,” states the 2017 Consumer Content Report. Brands that have word of mouth supporting them stand out more than ever because it’s so difficult to generate. That leaves brands with a couple takeaways: 1.) Driving buzz is a huge differentiator when consumers are less willing to talk about brands than ever and 2.) digital is the way to do it. Traditional channels may reach people with a message, but it’s less likely to make them talk. Posted in Strategy and tagged with Conversation, Word of Mouth, Channels. April 5, 2019 by Taylor Wiegert.